Best part about Valentine's Day being on a Saturday? Brunch!! 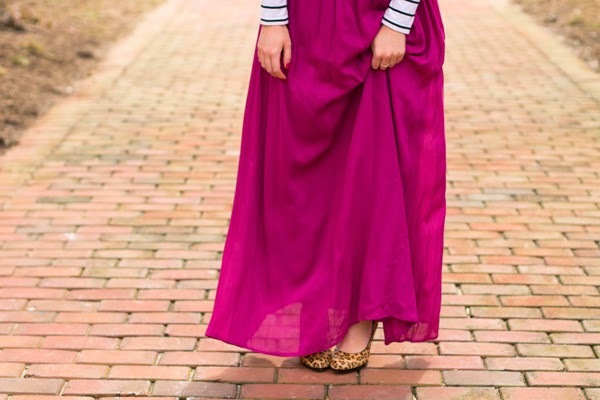 Shop Hope's Maxi Skirt (coral) // Striped shirt, similar // Leopard Heels // BaubleBar Earrings // Sephora Lipstick in "Hot Tango"
I looooove a good brunch! Not only because it's an excuse to eat a bunch of delicious food and wash it down with mimosas but also because it's the perfect time to try something new with a winter outfit. 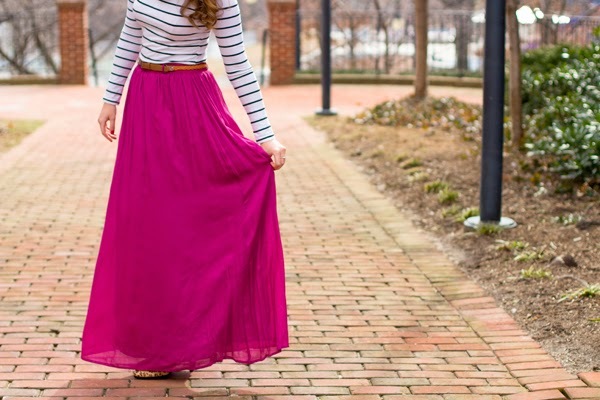 A blazer over a graphic tee, a cool hat with chunky necklaces, or a maxi skirt with fun pattern mixing! Brunch is the perfect time to wear trendy new booties or a poncho. Did you just get a new clutch you've been dying to carry? Perfect because you'll be able to show it off in the daytime! 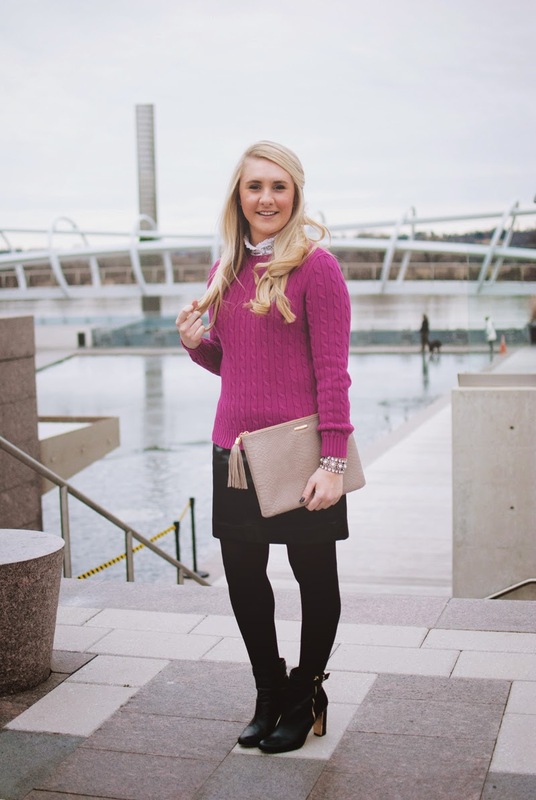 My DC blogger babe, Kristyn, of Primp & Proper, put together another awesome brunch outfit complete with leather and the perfect pop of pink! How beyond incredible are her booties? Gold details? Eek! 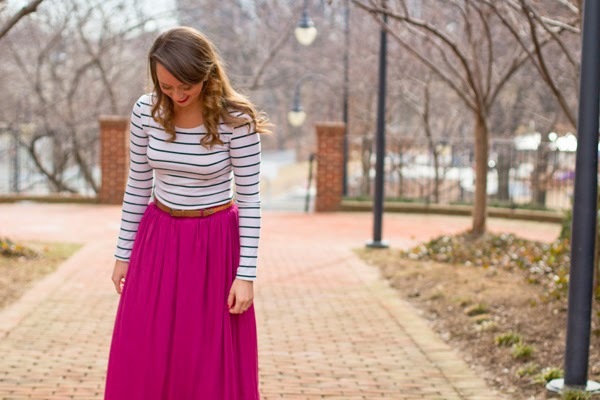 Make sure to check out her blog for some more brunch outfit inspiration and her top picks for DC brunches! 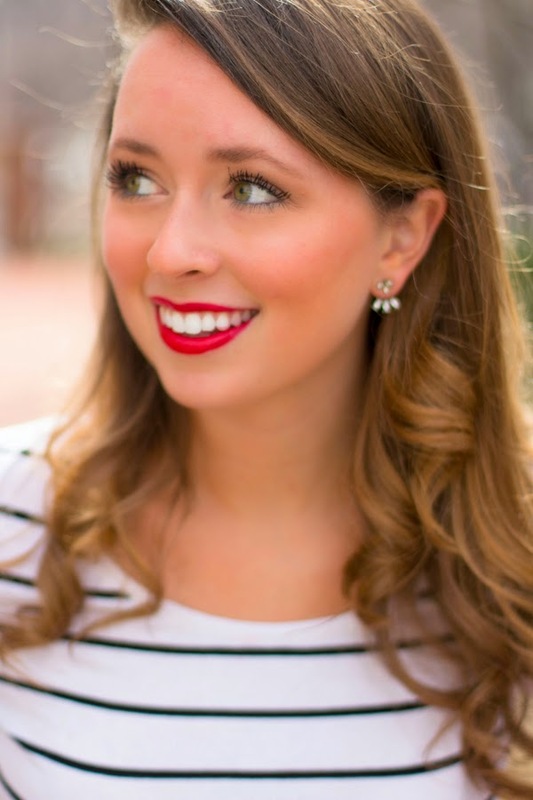 If I were to be out brunching this weekend with Kristyn these would be my top picks! Valentine's Day or not - it's always fun to brunch with the girls over champagne and girl talk! 1 // Farmers Fishers Bakers - by far the best brunch I've ever had. The buffet is filled with chicken and waffles, guacamole, omelet bar, cinnamon rolls, grapefruit brûlée, and sushi and shrimp appetizers that are walked around. I easily get one whole plate of bananas foster french toast as well. It's to die for! 2 // Agora - I went here the past weekend and was blown away at the quality of the food since it's $35 for all you can eat and drink (liquor included) for two hours. Let's just say I couldn't decide between the eggs benedict, french toast, and grilled cheese… so I got all three. Hey, I like to eat, sorry (not)!! 3 // Crios - A delicious mexican brunch spot - I just went here last weekend for one of my best friends birthdays (Happy Birthday Rachie babe)! I love trying your typical omelets and fried eggs with salsa, avocado, and beans. If you get the bottomless mimosas for $14 I recommend mixing the orange and cranberry - yummy! 4 // El Centro - Another deeeelicious Mexican brunch that is in one of the most fun parts of DC, 14th Street. The bottomless brunch is all you can eat and drink. Perfect tapas sized portions so you can be sure to taste everything! If you go you have to get the churros. Five plates of them. Just do it. 5 // Ted's Bulletin - A classic place to visit if you're in DC. You won't be disappointed with the breakfast burrito and their famous pop-tarts!! Beautiful! 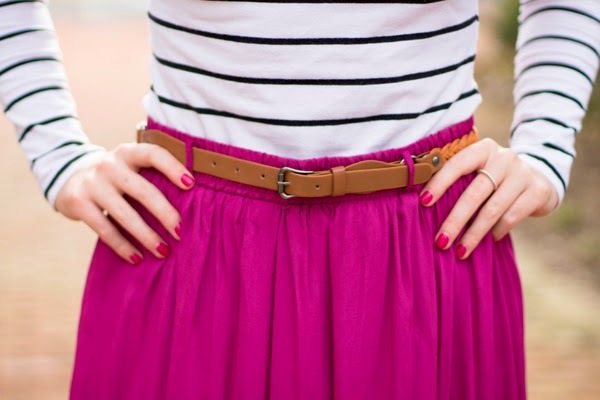 I love that bright pink color and it pairs so well with the stripes! Thank you so much, Kate!! 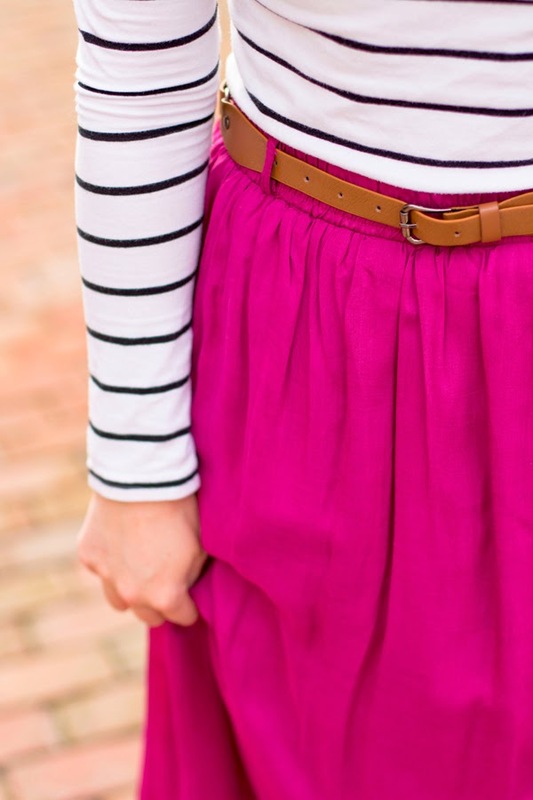 I want to wear this skirt EVERYWHERE!! 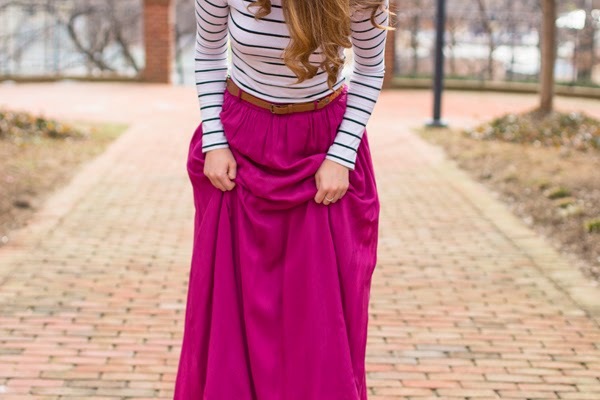 Love the color in that skirt!